A second teaser for the next phase of Marvel Comics characters in the Inhumans and X-Men families, "RESURRXION," has been released by the publisher. The teaser, bearing the same logo as the previous one, complete with the X-Men X and the Black Bolt O, now has a few pieces of new information. First, it says "An Ending. A Beginning." Hopefully this means an ending to the squabling between the two naturally superpowered families of characters in the Marvel Universe, and a beginning of a new era with both being treated and promoted well. 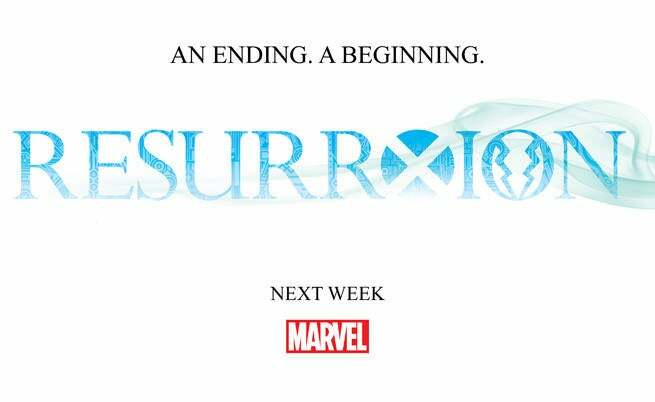 The second new element is "next week," and Marvel Comics confirmed that's teasing official information on ResurrXion is hitting next week, via Marvel.com. The ResurrXion comes after the "Death of X" and "Inhumans vs. X-Men" event comics from Marvel (the first of which is going on now), and the ongoing rivalry of the two groups coming to a head. While they were always a little on the confrontational side, recently it's been all-out war after it was discovered that exposure to the cloud of terrigen mists that transform Inhumans into their powered forms can also poison and kill mutants. Our speculation is that we'll see ResurrXion as a line-wide push for both families, similar to "Counter X," "Revolution," and "ReGenesis," rathat than an event comic or the return of a specific character or two. There's a possibility that the two groups could merge more completely (something that's already had some rumblings with individuals swapping sides a bit), but with the Inhumans film and TV rights at Marvel and the X-Men's rights remaining at Fox, that's sadly not likely for the publishing arm of the company. Initially announced at the start of September during a retailer summit, next week we'll find out for sure what ResurrXion actually is.